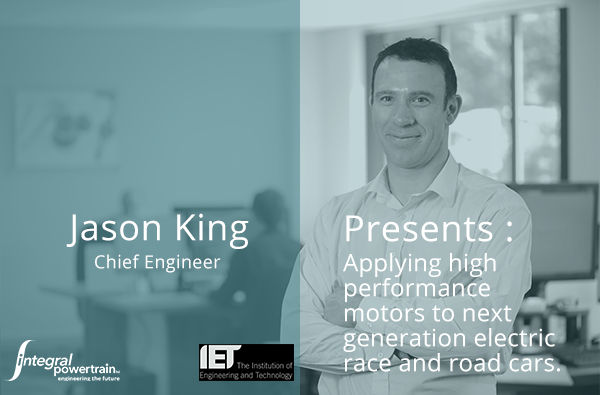 As a recognised leader in high performance electric motors, Integral Powertrain Ltd’s Chief Engineer – Jason King will present at the IET – Electrification in Motorsport seminar. He will share a leading powertrain technology and services provider’s view of the challenging requirements that must be faced, and overcome to maintain a winning electric powertrain for its clients. With a remarkable career in and around innovative, and high performance, powertrain, Jason has spent the last 4 years managing several significant client high performance electric motor projects. These projects have contributed to Integral Powertrain’s e-Drive division securing a leading position in a number of markets. With a solid background in Motorsport and prestige vehicle, projects are developing in commercial vehicle and aerospace sectors amongst others. Taking place at the Coventry Transport Museum, on the 8th March, the IET Electrification in Motorsport seminar is a must for anyone involved in the application of the latest developments in high performance electric powertrain. Integral Powertrain’s e-Drive technologies are receiving considerable interest from a number of industries with a widening range of applications. This seminar is an opportunity to listen to companies that, like Integral Powertrain, are re-writing the rule books with high quality products delivered in remarkable time scales. Jason’s presentation will look at what are the typical requirements for high performance electric motors. He will illustrate the principles applied to racing and high performance road battery electric vehicles, and how different electric systems solutions may be applied. The merits and downsides of the options will be discussed, highlighting system attributes such as power and torque density. He will also touch on the impact of motor speed range and gearboxes selection, power electronics requirements, the effect of voltage and total efficiency. With something for the enthusiast and for the experienced professional, Jason’s presentation and insights will give attendees plenty to think about and inspire current and next generation engineers alike. Visit the IET Seminar page for more information.